Dabeli is a popular street food of Gujarat. Dabeli means ‘pressed’ in Gujarati. 1. Wash, boil/cook, peel and mash the potatoes. 2. Dry roast peanut, remove the skin. add asafoetida. Add onions and cook till transparent. Add dabeli masala, sugar, salt, mashed potatoes and little water.Mix well, remove from heat. 4. 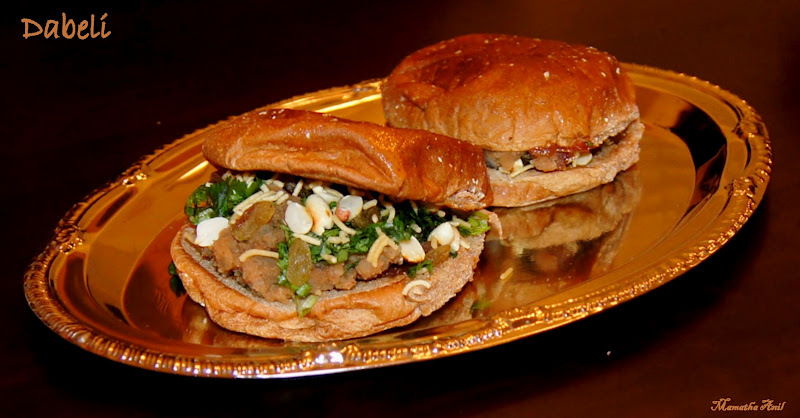 Cut the bun/pav into half and spread the tamarind chutney to both the pieces. 5. Now put the potato filling on the lower half of the bun. Top it with roasted peanut, chopped onion, cilantro, raisins and sev. Sandwich it with the upper half of the bun. 6. Roast both sides of bun/pav on tava with little butter. Serve hot. Note: You can also roast the bun first and then do the filling part.